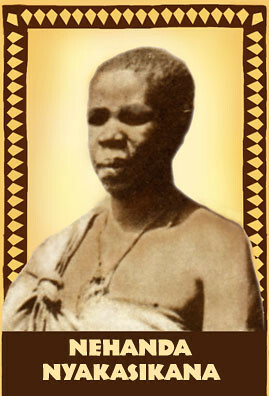 Nehanda was the leader of the resistance organized by the Mashona people against white-settler colonialism in Zimbabwe. She was captured and executed by the British for her fearless struggles against British imperialism., a photo by Pan-African News Wire File Photos on Flickr. The Zimbabwean ruling party Zanu-PF recently passed a resolution to rename the Victoria Falls. “Institutions bearing colonial names must be changed and be given indigenous names . . . school syllabuses in schools must also change,” observed Local Government minister Ignatious Chombo. Restoring our fallen heroes’ names should make us proud. By deciding to resume the real name of Victoria Falls, Zimbabwe has harbingered what Ngugi wa Thiong’o calls the decolonisation of the mind. While I don’t support Ngugi’s entire take on this, Zimbabwe’s take is commendable. It is sad to find that after over 50 years of independence, many African countries still pointlessly cling to colonial hangovers. Some countries that took bold steps by totally abolishing colonial names include Burkina Faso and Democratic Republic of Congo (DRC). If this resolution is carried through, it is going to bring cultural and historic changes in the minds of Zimbabweans. As Africans, the time for assuming our true identity has arrived. We should aspire to emancipate and decolonise our minds and countries. While Zimbabwe’s struggle to do away from colonial leftovers started a long time ago when Salisbury was renamed Harare just like Lourenco Marques in Mozambique that became Maputo, Harare still has many streets, roads and other places with colonial names such as Coventry, Lytton, Prince Avenue, Prince Edward Swimming Pool and Lawley, Borrowdale. We currently still have capital cities which bear colonial names such as Dar es Salaam (Mzizima or healthy town in Swahili) which assumed an Arab name in 1866; Freetown (Koya Temne renamed in 1787); Lagos (Eko in Yoruba renamed in 1372 by Portuguese to mean Lakes); Windhoek (Aill Gams in Khoekhoe to mean hot springs; or Otjomuise in Otijherero to mean streams was renamed in 1844, Libreville (1839) and Niamey (Arlit 1890) to mention a few. When you tell people to replace colonial names with the original ones they complain about expenses of changing books. Is there any fiscal value equal to one’s real and true identity? Why should Africa have many foreign names in many places while foreign countries don’t have any African (savagery names)? Can’t we respect and appreciate our identity? Does this need donor aid or external expertise? Returning to our true past is our duty. While animals can accept any names given to them because they don’t use them, to the contrary, humans should not act like animals to forget their history as in the case of Africa and superimposed-colonial names. Zimbabwe once again proves that amid international criticism, she still has something nice to offer in terms of cultural heritage and self-awareness. The author is a Canadian-based Tanzanian and author of Saa Ya Ukombozi.